Allow me to introduce you to my grandmother. | Where will M.S. take me? Allow me to introduce you to my grandmother. I think of her often these days. I recently saw a picture of myself that immediately brought her to mind. I am sitting in a wheelchair with my knees resting against each other. I am smiling and enjoying the company around me on a very social evening. What made me think of my grandmother? Even when she was in her 90s and used a wheelchair to get around, she was always ready to enjoy herself. With her pretty, high cheekbones and mischievous eyes, she was patient and clever. She taught me a lot. How to cook a good spaghetti sauce. How to be grateful for the small things in life. How to appreciate poetry. I knew her for a long time, from the time I was born until she passed away when I was in my 30s. At different stages in my life, I got to know different sides of her. A charming, mischievous and open-minded artist, she worked very hard. She was unassuming, but expected nothing less than excellence. She loved and forgave. As I watched her age and grow more frail, while I grew stronger, I learned that the physical reality of her presence did not reflect the essence of who she was. I remember when we were living in Ontario in the 1970s, she and my grandfather were taking English as a second language classes. She showed me an essay she had written for the class. She explained she had to choose a topic from a few the teacher had given. She chose to answer the following: “Is it better to have loved and lost, than never have loved at all?” I was young and remember reading the paragraph, but not quite understanding it. She explained to me that it was better to have loved and lost. I remember looking at her wide-eyed, thinking to myself: “Si Nonna, if you write it, then it must be true.” I think back now of all the stories she told me and realize I had absorbed this: there will be pain, frustration and discomfort in life; joy is mine to find. This entry was posted in Caring for others, living with multiple sclerosis, poetry, relationships and tagged frustration, Grandmothe, joy, love, poetry, wheelchair on November 2, 2015 by rita kindl myers. An amazingly beautiful tribute to your grandmother and how she loved . And beautiful last lines . Thank you. Something we share – amazing grandmothers who made a lasting impression on us and all those around her. 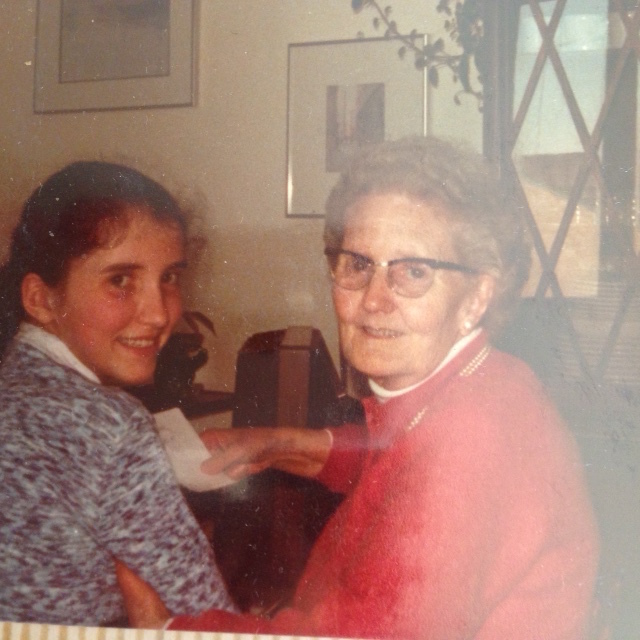 I think about my grandmother every day and she has been gone for over twenty years. I so enjoyed reading this just now, Rita. What a wonderful essay on your heritage. Love the photo. I love this instalment Rita! Thank you for having written so eloquently and encapsulated the memory of Nonna, and shared your memories and the wisdom that we gained from her.